I planted 5 of the VA Dept. of Forestry hazelnut trees last fall and am hoping that at least three survive. I checked my tree tubes and a couple are already showing a bit of green. I have ordered from a nursery in the Pacific NW two named varieties that are Eastern blight resistant that should be arriving soon. In a few years, I hope to be cracking nuts–maybe with my own little vice grip. Thanks for the education via the blog. I enjoy it. I’m glad to hear that you got hazelnuts from the VA Dept of Forestry. There weren’t on the list when I checked, but maybe they’ll come back. It will be interesting for you to compare them with the European ones you’ve ordered. Adding nuts to your garden is great! 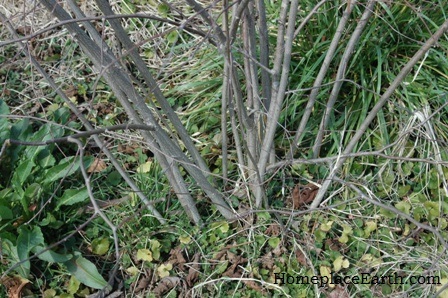 I have two hazel shrubs that I planted about 5 years ago. They are doing ok, getting big. I tend to hand pollinate to make sure I get a good crop. White fly are a big problem causing leaf curl. Any suggestions for that? Also the real reason I am replying is that I get a lot of nuts from the tree but they tend to have very small nut meat in the shell and are shriveled up. I have been harvesting them while still green and on the tree. Should I wait till they are dry on the tree? Note. Here in WA state the birds tend to get them before anything else. Crows and Blue jays. I don’t have any suggestions for white fly and leaf curl. Waiting until the nuts dry on the tree is best. Maybe you could cover it with birdnetting to stop the crows and bluejays. Ask others in your area what they do. I got two trees free from Virginia’s extension service in Arlington (along with a service berry). I’m keeping my fingers crossed they they will grow well, but they overwintered well (not to hard because of milder than usual winter). Although there are only two, I’m optimistic. Catie, they will probably do fine. 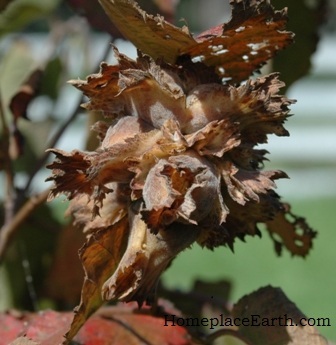 Hazelnuts are pretty hardy. I purchased two filbert trees from a gardening catalog last year along with an almond tree. The almond tree survived, but I lost both filberts. They were delivered bare root and I don’t think we got them in the ground fast enough. The almond tree’s original trunk does not appear to have survived, but there are several side shoots that are taking off. I really love filberts/hazelnuts so I will definitely try again. I will see if I can find them locally–GA. Thank you for the information! The closer you can find the new trees, the better. Maybe those with good hazelnut trees will begin to propagate them and give, sell, or trade them locally with others. If trees have been grafted and the original trunk dies, what grows up from below the graft won’t be the same as what you had planned on. That happened to me with a mulberry tree I bought. I had put the tree in the chicken yard and wasn’t banking on any particular harvest for our kitchen, so it didn’t matter. The chickens don’t care what kind of berries they’re gobbling up. I purchased my plants from St. Lawrence Nursery in NY. They were listed as hazelberts…a cross of some kind? Either way they are producing very well after 4 years here in central VA.
Have you seen the plans Martin Crawford has for a hazel cracker? I think it is something that does more than one nut at a time and that the plans are contained in one of his AgroForestry News booklets but I haven’t seen it. We found the single nut cracking somewhat tedious and some of my nuts were bitter . I think this came from the papery covering, not the nut itself. I’m hoping you’re going to include processing/recipe ideas in the next post. Thanks for the great blog! Vicky, I’m not familiar with the hazel cracker you mentioned. I recently got a Master Nut Cracker for black walnuts and found out that it also had smaller “anvils” for using with hazelnuts. I thought that my hazelnuts might still be too small, but it works great for all but the very smallest, just cracking the outer shell and leaving the nutmeat whole. http://www.masternutcracker.com. The nut cracker I had used previously for black walnuts is no longer manufactered. The one I used I’d borrowed from a friend. Your nuts might be bitter because of when they were picked, how they were stored, or just that that tree yields different tasting nuts. 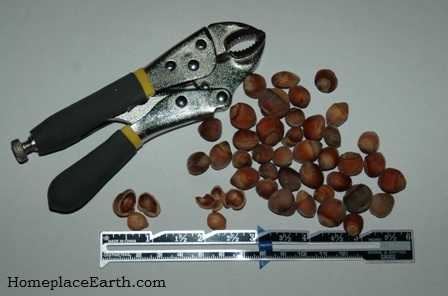 I’ll probably write another post about hazelnuts in the fall and talk about this nut cracker. I had no idea you could grow hazelnuts in Virginia. I learned so much from this blog post. We grow food for Feedmore’s Community Kitchen Garden here at Lewis Ginter and they are always looking for healthful foods that have a good shelf life. It makes me wonder if we could grow hazelnuts or pecans for them since they seem to store so well. Jonah, you can grow nuts for other people, but then you have to teach them how to eat them. 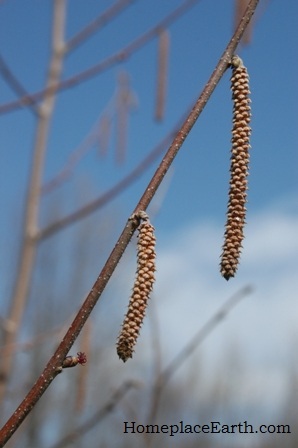 Nut trees add another dimension to the permaculture garden and diversity is always good. I love growing food that can store well without doing anything really special to it. Onions, garlic, Irish potatoes, sweet potatoes, cowpeas, peanuts, and winter squash all fall into that category. Butternut squash is a good long lasting winter squash. Acorn squash perishes sooner and is more susceptible go insect damage. I bought two different varieties from Edible Landscapes near Afton, VA, and they actually had a few nuts on them in the large containers. They are doing very well but sheep got out and nibbled off a lot of the branches so am starting over again! The vicegrips work great on cracking pecans too, you can get an entire whole nut out once you get the pressure right.